PhD in Mathematics, PhD in Interdisciplinary Mathematics,as well as several exciting programmes in development. Prospective PhD applicants interested in research in the specific areas of MASDOC should apply to Warwick via the standard PhD routes for the departments of Mathematics and Statistics. Please contact c.a.richley at warwick.ac.uk with queries. concerning MASDOC. PhD projects in MASDOC vary greatly, from Pure Mathematics to Applied Mathematics and from Theory to Methodology to Applications. Students may specialise in one of the themes or combine techniques from two or more of the themes. 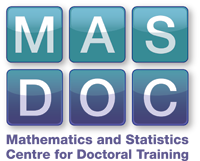 MASDOC students develop invaluable skills which are applicable in a broad range of possible careers, from pure academic research through to scientific modelling in industry. Supervision of the highest quality is provided by a large body of SUPERVISORS comprising full time permanent Warwick Professors. A MASDOC student speaks about the programme HERE . See Department of Mathematics and the Department of Statistics for more general information about postgraduate study in the departments. The Warwick Mathematics and Statistics departments hold Athena SWAN Bronze awards. The Athena SWAN charter evolved from work between the Athena Project and the Scientific Women's Academic Network (SWAN), to advance the representation of women in science, engineering and technology (SET).